As much as colour can be used to impress your personality onto a room, for some people, the thought of plain painted walls comes over as being just a little on the boring side. This is often particularly the case in large rooms, where large expanses of plain walls can become monotonous after a while. There are, however, ways of making one or all of your walls totally unique – and creating focal points in the process. Here are some of them. Naturally, it is first of all essential to ensure walls are clean, dry and free of dust, flaking paint and other particles. If already featuring a fairly dark, strong colour, it is often best to apply a coat of white paint before adding other colours to prevent the previous colour showing through. This can be done using a standard paint roller. Once this coat is dry, paint the walls in the main colour you intend to use and allow to dry again. For obvious reasons, it is necessary to start with the lightest out of the colours to be used. If, for example, you intend to create a fairly bold effect using contrasting colours like eicó e15 Butter and b4 Gypsy’s Luck, the paler e15 Butter should be applied first. As such a bold look can easily become overpowering if used on all walls, it is recommended to keep three walls in the main, paler colour and just add the effect to the fourth wall, which will also help to create a focal point for a room. 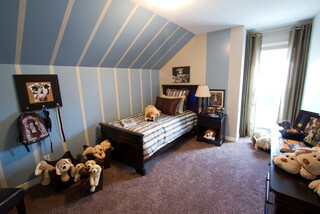 Vertical stripes are a great way to add interest to a wall and make it unique. It should, however, be noted that they will invariably make a room appear higher. If ceilings are already impossibly high, it may be better to opt for horizontal stripes or another pattern – but more of that in a moment. To create bands of a contrasting colour, prepare the wall as shown above and then use a measuring tape and soft pencil to mark out vertical bands. If you wish these bands to be of uniform widths, it may be best to measure the complete wall and divide the measurement by the intended width of the bands to see whether adjustments are required. It is better to have a slightly wider band of the main colour at both ends of the wall than to have a decidedly wider band at just one end. Measure and mark your bands with double pencil lines allowing for the width of your masking tape and using a spirit level to ensure the lines are straight. After applying masking tape inside the sets of pencil lines, use a smaller roller or a stencil brush – depending on the width of your stripes – to apply the contrasting colour. Allow to dry thoroughly and then carefully remove the masking tape. It is important to let the paint dry properly to avoid smudging the line between colours when removing the tape. Another option is to apply horizontal lines, although this should be done with great care when using this method in already fairly low rooms, as they can ‘cut a room in half’. In this case, it is often better to use different shades of the same colour. To heighten a room, the darkest stripes should be at the bottom, gradually getting lighter as you work up the wall. High ceilings can be ‘brought down’ by starting light at the bottom and getting darker towards the top. The technique of applying horizontal stripes is essentially the same as the one described for vertical stripes. After preparing the wall and painting it in the base colour, stencils can be used either randomly or to create repeat patterns. To create repeat patterns, the required stencil positions need to be determined by measuring the wall and marking positions with a soft pencil. It is important to ensure pattern finishes will appear the same on both ends of the wall and make sure pattern lines are straight with the help of a spirit level. Whether applying random stencils or repeat patterns, the next step is to attach the stencil to the wall using either stencil mount (which should be sprayed to the back of the stencil) or masking tape (low-tack). The desired second colour can then be applied using a small roller or, in case of small stencils, a stencil brush. It is again possible to use contrasting colours, or – for a more subtle effect – two or more shades of the same colour. A broad, but subtle leaf pattern, for instance, could be achieved by making the base colour eicó’s d2 Apple and using d7 Folly for the stencil paint. Once the second colour has been applied, the stencil should be removed immediately. Each pattern repeat should be allowed to dry before moving on to the next to prevent smudging patterns/ lines. If you have found this post useful, or if you have other suggestions on how to ‘jazz up’ a wall, we’d love to hear from you. Please leave your comments using the form below.